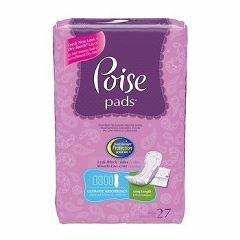 Poise Pads - Maximum Absorbency, Regular Length 12.4"
Poise Pads with ContourFit - Moderate Absorbency Long Length 12.20"
Poise Pads - Ultimate Absorbency, Regular Length 14.37"
Poise Pads - Moderate Absorbency, Regular Length 10.9"
Poise Incontinence Pads, Ultimate Absorbency, Long 15.9"
I can't thank you enough for your professionalism, kindness, and dedication. As you are aware, this past January we lost our father to COPD. You were truly a blessing to our family with your understanding and sympathy. You worked with us to ensure the successful installation of the scooter lift only to have my father pass a few weeks later; he never got the chance to use it. You helped us with the return and refund and I cannot thank you enough. You were truly a godsend and we will use Allegro Medical in the future for all of our medical needs. Is has been a pleasure dealing with a company with high standards and compassion.....everybody has been great. I will not hesitate to use you in the future, and to recommend you to all. Thank you.